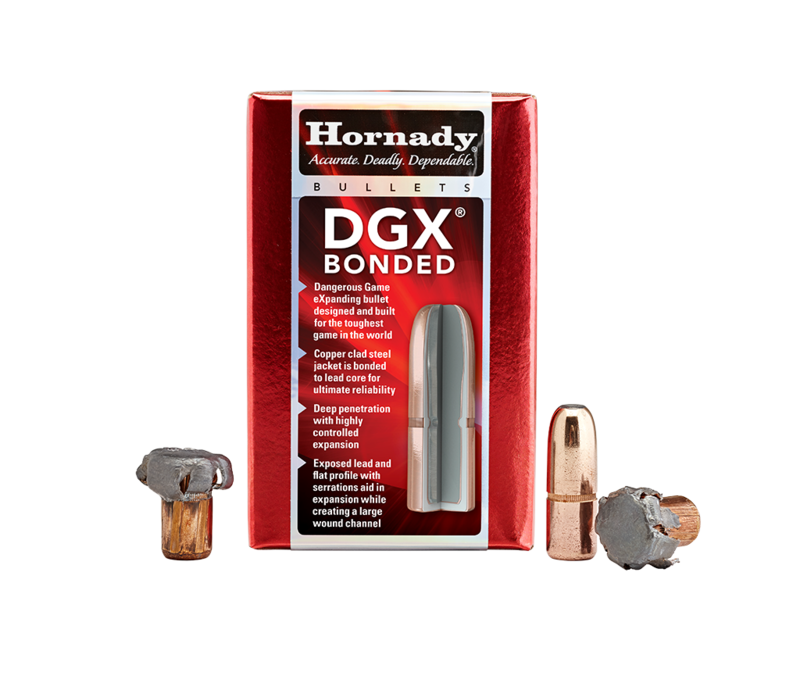 The DGX® Bonded (Dangerous Game™ eXpanding) bullet features a copper-clad steel jacket bonded to a lead core to provide limited, controlled expansion with deep penetration and high weight retention. Bonding the jacket to the core prevents separation from high-energy impact on tough material like bone, ensuring the bullet stays together for deep expansion. DGX® Bonded bullets are built to the same profile as the corresponding DGS® (Dangerous Game™ Solid) bullets but expand to 1½ to 2 times their bullet diameter. The thicker 0.098” copper-clad steel jacket of DGX® Bonded sets it apart from other dangerous game bullets, allowing it to tear through tough material like hide, muscle and bone. DGX® Bonded features a flat nose with serrated sections to deliver a uniform expansion from 100 to 150 yards and straight penetration, reducing possible deflections. The bonding process locks the jacket and lead core together, improving the retained weight of the expanded bullet.